Tandem skydiving really is a great way to experience your first skydive. You will experience the rush and amazing beauty of freefall at around 120 mph on your very first skydive. This will last just under a minute and you can enjoy the whole incredible experience knowing that you're in the hands of a friendly, qualified skydiving professional. On arrival you will have a 30 minute briefing before getting into your flying suit for the skydive. Our purpose built skydiving plane will take you up to 14,000 ft then the adventure will start. Your instructor will deploy fly and land your parachute leaving you to simply enjoy the thrill of your life! At the end you can collect your skydiving certificate and optional DVD. Everyone must complete a declaration of fitness to parachute, anyone aged 40 or above must get this signed by their GP. The minimum age is 16, anyone under the age of 18 must have parental consent form signed. 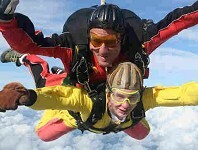 Please note that membership to the BPA is compulsory wherever you skydive in the UK.